A key discovery on the birth of stars and unexpected conditions in the early universe by Arizona State University cosmologist Judd Bowman and his research team has been chosen by the U.K.-based publication Physics World as one of its top 10 "Breakthroughs of the Year." Bowman is an experimental cosmologist interested in the formation of structure in the early universe, the great Cosmic Dawn that includes the very first stars, galaxies and black holes. After 12 years of research, last February, Bowman’s research team — which included Raul Monsalve, Thomas Mozdzen and Nivedita Mahesh in ASU’s School of Earth and Space Exploration, and collaborator Alan Rogers of the Massachusetts Institute of Technology — used their specially constructed experiment at the Australian national science agency's (CSIRO) Murchison Radio-astronomy Observatory (MRO) in Western Australia to observe colder-than-expected hydrogen gas that existed just 180 million years after the Big Bang. 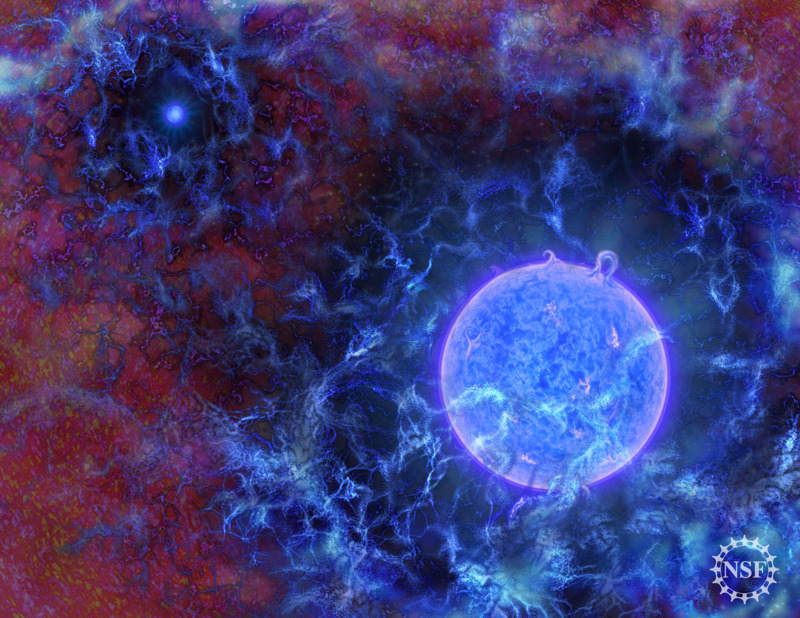 The discovery provided the first evidence for the oldest ancestors in our cosmic family tree. But a bigger surprise was the temperature of the gas around those early stars. One possible explanation is that the primordial gas was cooled through extremely weak interactions with dark matter. There is five times more dark matter in the universe than normal matter, but it has never been directly seen; instead it is inferred to exist due its gravitational influence on other objects. If confirmed by additional investigations, the discovery by Bowman and his team will have provided the first clues in the decades-long search for the nature of dark matter. Finding such signals is a painstaking process that took the research team more than a decade to develop technology to accurately separate signal from noise. By necessity, much of Bowman's data collection takes place in the desert outback of Western Australia and in other remote sites around the world where interference from human-generated radio sources like FM radio and TV stations is greatly reduced. Through their Experiment to Detect the Global EoR Signature (EDGES) project, the team measured the average radio spectrum of all the astronomical signals received across most of the Southern Hemisphere sky. The signals detected by the radio spectrometer for the study came from primordial hydrogen gas that filled the young universe and existed between all the stars and galaxies. These signals hold a wealth of information on the conditions in the early universe that opens a new window on how early stars — and later, black holes and galaxies — formed and evolved. And while further observations are needed to back up this hypothesis, noted Physics World, the research could help resolve one of the most important unsolved mysteries of physics: What is the nature of dark matter?